Are you looking for an easy to make dessert that is super good?? Well look no further, this Peanut Butter Cake is it! As you know Kris and I like to watch The Kitchen on the Food Network and this was on the other week. Recipe courtesy of Molly Yeh, who also has a show on the network – Girl Meets Farm. I was able to toss this together after work as we had an old friend in town. She and the girls, a few neighbors all came over for cocktails and cake. It was a wonderful evening. Not to much to gather to start the process. Another reason I liked this recipe is it only calls for one cup of flour. 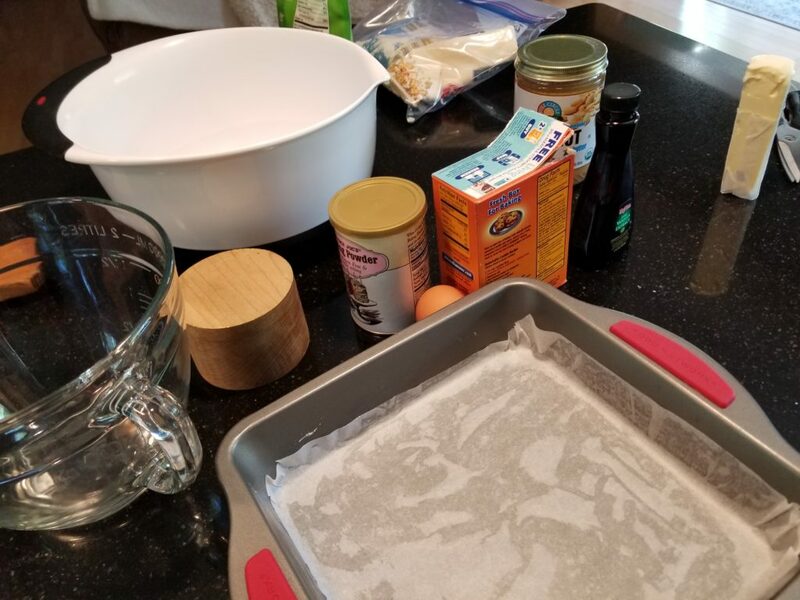 Being gluten free I always sub out the regular flour with GF which can sometimes make desserts a little dense if there is a lot of flour in them. One cup = no worries. Nobody will be able to tell the difference! 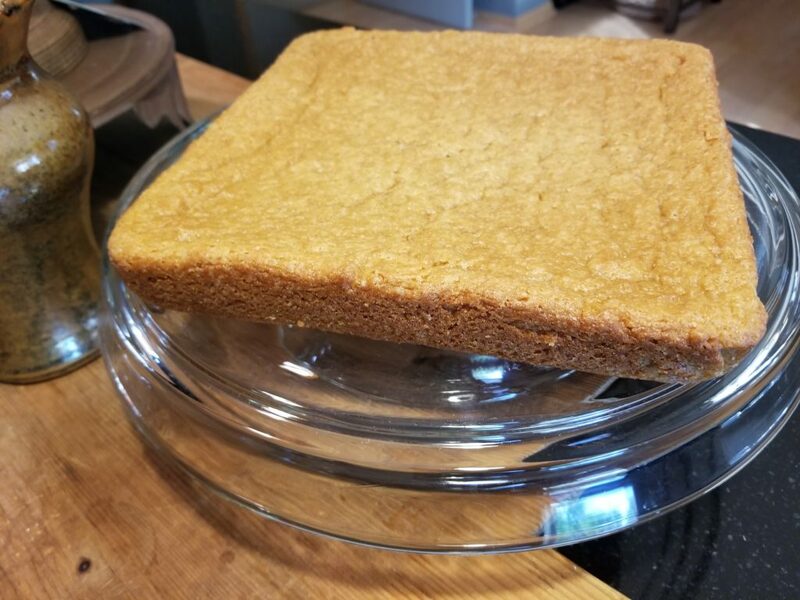 (I only had a 9 x 9 pan so my cake came out a little flatter) After baking, let cool completely before adding the toppings. 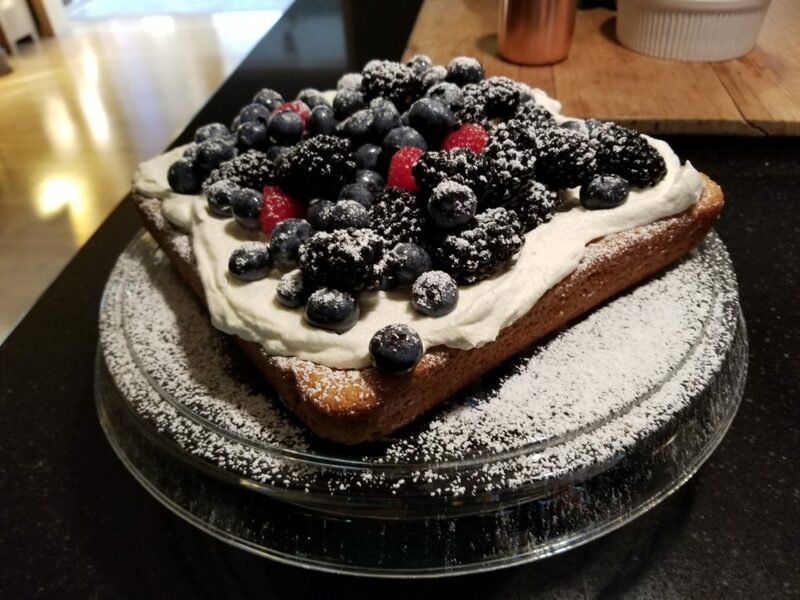 I used homemade whip cream and fresh berries. So good! I think next time I may swirl some jam in the batter to make a peanut butter and jelly cake……Cheers! Preheat the oven to 350 degrees F. Grease an 8-by-8-inch baking dish and line the bottom with parchment. In a large bowl, whisk together the sugar, flour, salt, baking powder, and baking soda. In a medium bowl or large measuring cup, whisk together the egg, vanilla, buttermilk, oil, water, and peanut butter. Add the wet ingredients to the dry ingredients and stir to combine. Pour into the baking dish. Bake until a toothpick inserted into the center comes out clean. Begin checking for doneness at 30 minutes. Cool in the pan for 10 minutes. Remove to a rack to cool completely, or serve while it’s still warm. Serve plain or with desired toppings. “Molly on the Range: Recipes and Stories from An Unlikely Life on a Farm” by Molly Yeh © Rodale Books 2016. Provided courtesy of Molly Yeh. All rights reserved.